We have begun to extend to all of you a download that you will be receiving in the coming weeks, as you close in on the equinox. 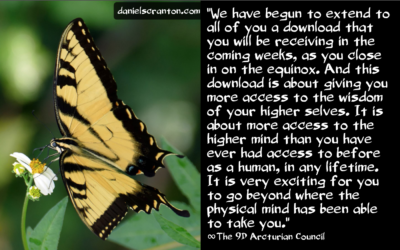 And this download is about giving you more access to the wisdom of your higher selves. It is about more access to the higher mind than you have ever had access to before as a human, in any lifetime. It is very exciting for you to go beyond where the physical mind has been able to take you in terms of knowledge, and even logic. Having more access to your higher mind will mean that you are capable of knowledge about past lives. You will be capable of receiving that knowledge. You will be also accessing more of your awareness of the memories of times when you have connected with extra-terrestrials in this lifetime, both in the physical and in the astral realms. The higher mind is going to give you more awareness of the versions of you existing in parallel universes as well. And you will have more knowledge of how to work with your chakras, how to work with crystals, how to work with the energies that are all around you, and how to work with the beings that have been supporting you your entire lives. We are talking about the Earth, the sun, and your guides. These are the three biggest supporters that you have in non-human form. Some of you have had wonderful support in the human realm. Other of you have had none, and that was by choice. Well, you’ve had virtually none. Everyone has been supported at some point by someone, but you know what we mean. You haven’t had consistent support, some of you, from other physical human beings. Now, as you get closer and closer to the equinox, it will get easier for you to feel this download coming, to unwrap it, to unpack it, and to give it to yourselves. When you receive something from beings like us, or other high frequency beings, the act of receiving it is a gift that you give to yourselves. We are just happy to be on this journey with you, and we are happy to listen to what you need. We hear you, we respond to you, and we give you what we can when we can. Some of you, of course, already access your higher minds, from time to time, and even those of you who have been doing this will have greater access. And so, enjoy the gift of the equinox.